It may not feel like it outside, but the long summer is over and winter is here. Game of Thrones fans tuned into the show’s eagerly awaited seventh season two weeks ago in record numbers. At 16.1 million live viewers, the episode beat the HBO record for a season premiere. That’s more than the population of New York, LA, and Chicago combined. The old record for a premiere audience, you may have guessed, was also held by Thrones for last season’s debut, which brought in 10.7 million live viewers. Keep in mind that last season started much earlier in the spring months when television audiences are typically much larger. 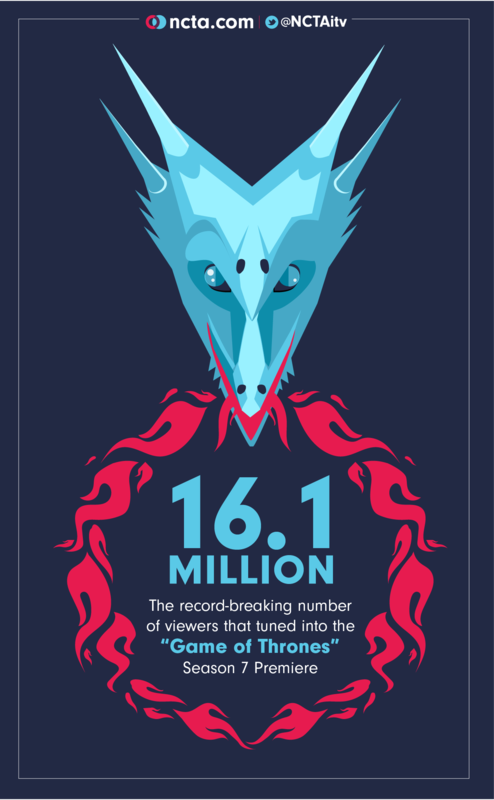 Even more interesting is that of those 16.1 million people, 10.1 million watched by tuning into HBO, while the remaining 6 million watched via DVR or streaming (HBO Go, HBO Now, etc). That’s over 1/3 of the entire live audience who watched through a streaming service or DVR. We know that these on-demand services are fundamentally revolutionizing how people think about and consume television. The premiere was the most tweeted episode of all time, bringing in approximately 2.4 million tweets between 6 p.m. and 2 a.m. EDT, according to Twitter. But shows like Game of Thrones prove that the more things change, the more they stay the same. In a world where shows are written to be binge watched in one sitting, it’s rare to see this kind of phenomenon. But given the popularity and intensity of the show it makes sense; if you don’t watch live you run the risk of having all the twists and surprises spoiled for you online or at the office. This is a show with such a loyal and attentive audience that The New York Times ran a piece about viewing etiquette for fans. When it all ends next season, will another show have the same live-viewing-event phenomenon, or does Thrones have some of Melisandre’s magic working to its benefit? Given the high quality of programming available today, it wouldn’t be surprising if we see the same phenomenon repeated after the sun sets on Westeros.